Many people began their war tax resistance as a direct response to a war, a battle, or an atrocity, such as the Vietnam War, the Iraq wars, US interventions in Central America, or the ongoing training at the School of the Americas. 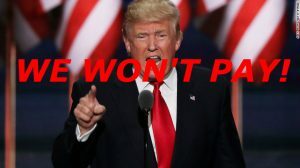 In the past year, new resisters (some calling themselves war tax resisters, some not) have been motivated by militarism, bigotry, and corruption in the Trump administration, including financial conflicts of interest, the border wall, restrictions on immigrants and refugees, and nuclear antagonism. At the same time, many things happening today are ramped-up versions of policies and practices that already existed (border security, deportation, nuclear proliferation, increased militarism). So what do we do to keep from being flung from issue to issue and back again, like pinballs? NWTRCC has tended to be an organization that organizes for the long-term. Since we’re consensus-run, decisions about endorsements, direction, new campaigns or themes, etc., can take a while. By the time NWTRCC would get to evaluating a particular approach or campaign, another issue may have taken precedence. And, in fact, a particular strength of NWTRCC is our steadfastness through every administration, Democrat or Republican, refusing to pay for wars and militarism no matter what. We can and do respond to news of new wars, violence, or militaristic antagonism, but we’re always looking at the military system as a whole, maintaining a steady critique. Some folks just learning about our tactics dream of quickly mobilizing thousands for a short-term or highly targeted tax resistance. A recent tweet asked (paraphrasing): “Is there a organized group to resist paying taxes to this fascist government?” Although individuals have spoken out, and some have tried to organize campaigns, there is no active group currently working on tax resistance against the Trump government (that I know of). Nevertheless, NWTRCC’s resources can be helpful to a variety of folks considering principled tax resistance against the Trump administration! 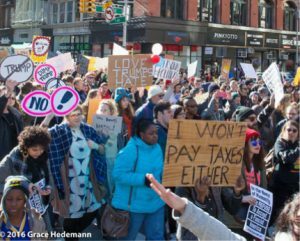 While we continue the long-haul work of providing support to new and current war tax resisters, I’m curious to see if a vibrant movement around resisting taxes to the Trump administration materializes for the 2018 tax season. In fact, I personally invite it! Many individuals have begun resistance – will a movement or a group form, just as NWTRCC coalesced to meet the needs of resisters in 1982? And please contact NWTRCC to tell us if you’re organizing such a project – we like to stay informed and connected!